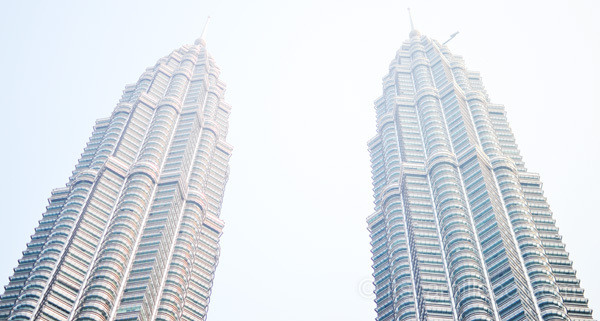 What trip to Kuala Lumpur is complete without a visit to Petronas Twin Towers? The first time I visited KL for Nuffnang Asia Pacific Blog Awards, I was only able to see the famous Twin Towers from afar. This time, I was lucky enough to go all the way up to the 86th floor! But before I show you the wonderful view from the top, let me show you what I wore. This was the same day we were scheduled to meet THE Jimmy Choo (photos and videos to follow) so I made sure to bring a pair of heels with me. Of course I wasn’t crazy to wear stilettos to Petronas! I had my trusty Footzyrolls with me to change into. Okay, so back to the Petronas Twin Towers. 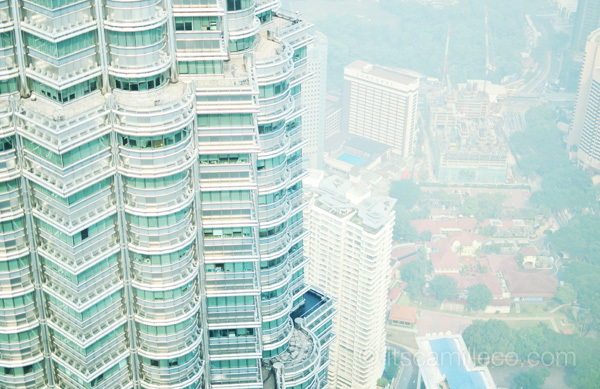 One of Kuala Lumpur’s main malls, Suria KLCC is actually located at the base of the towers. 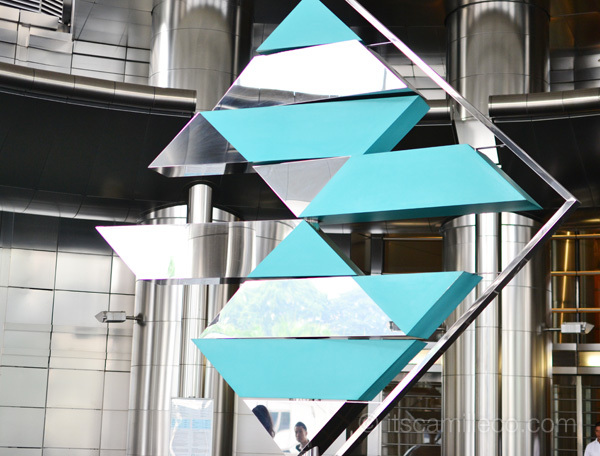 Before you enter the tower, you’ll see this structure called Kinetic I and II. Similar to the Petronas Twin Towers joined by the Skybridge, they symbolize unity in diversity which is truly what you’ll see in Malaysia. Before the tour started, we were greeted by a not-so-ordinary video presentation. We all found it really cool! 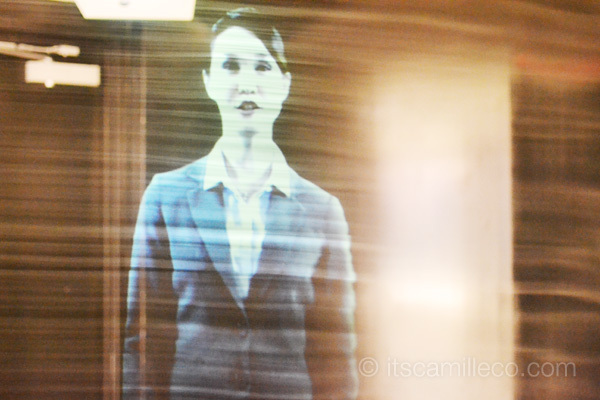 Instead of projecting the video on a screen, they did it on some sort of vapor or mist instead, so the whole time, it looked like an apparition of sorts! When we finally got to the 86th floor, this is the view that greeted us. We got to visit the Skybridge too, located at the 41st floor. 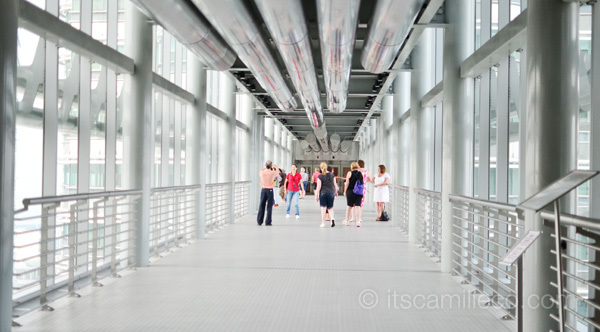 Little trivia: the Skybridge isn’t really connected to the Petronas Twin towers. According to our guide, this is for security purposes. So there you have it! 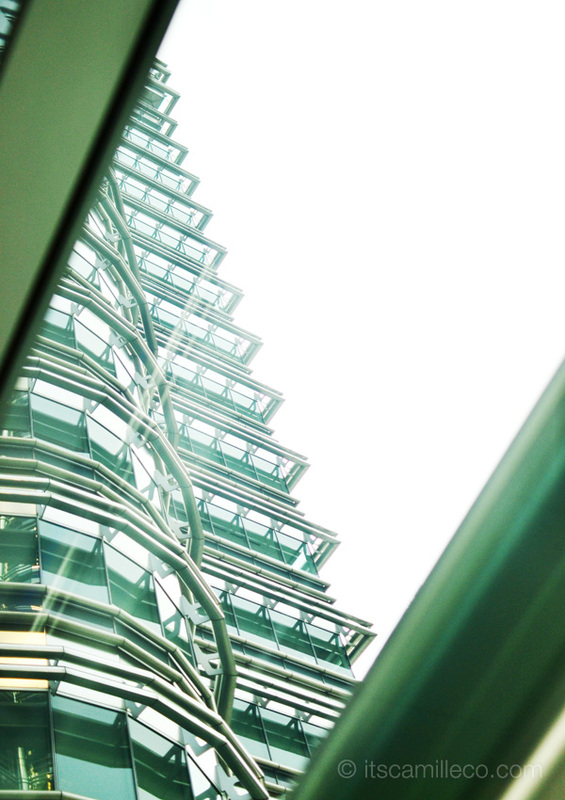 My short visit to the Petronas Twin Towers. To end this post, let me leave you with a photo of team Philippines. That’s Sir Butch Dalisay representing the Philippine Star, Happy Lopez for Cosmopolitan Magazine, host and radio DJ Andi Manzano and successful restaurant/bar owner GP Reyes. Turistang turista! I follow your blog. You really get me inspired. I have a question. Where can I buy palazzo pants? Do you happen know any store, online or mall that sells not so expensive pants. thanks mucheeee!!!! whoa, that’s one heck of a tour, more pictures! whoooo! love how you combine prints with silver, yellow, and things noone could ever imagine beautiful to pair with. you’re really awesome! I love the Petrona’s towers!! Thanks Anaivillo! You’ll love it there for sure! I love Andi! She’s so nice! I love your style :) What’s your favorite SM accessories brand? 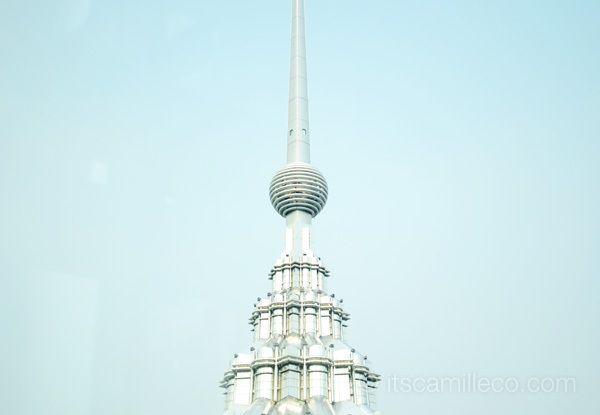 Hi Camille :) love your blog! Omg but I don’t have one! I really don’t haha! Wow. I love the outfit so much Ms. Camille. You’re stunning. Thanks Christine! :) I was supposed to but I ended up having to share with someone else. :) The photos without me in it were taken by me. If I’m in the photo, then it was probably the tourist guide or Andi or Happy who took it. Love your style by the way! Thanks for sharing it. Yeah, we really had to get up early or else we might lose our reserved slot. :) It’s worth getting up early! Like really you hurt my heart with happiness with these outfits! I love the print in pants! The stripes in the jacket! The yellow silver toe heels! 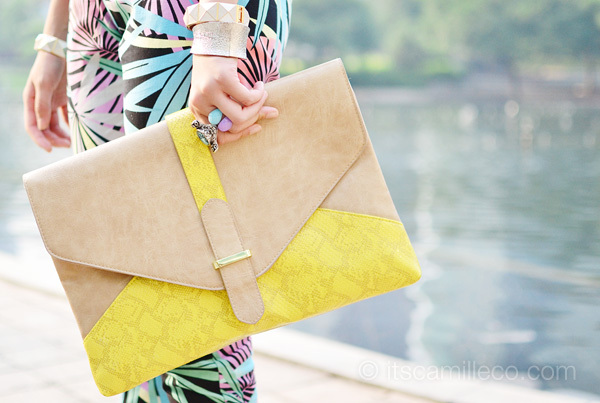 The yellow and tan clutch! All so Exquisite! Every time I have great pleasure to see You. Thank You for the opportunity to enjoy the beauty. My pleasure! I love sharing my travels with my readers! light hearted fiction romance anyone? xoxoandrea.com :) hope you visit! I so love your outfit~~! oh so wow to your sky bridge post. I enjoyed reading your blog. More powers and more budget too. Such a nice view! 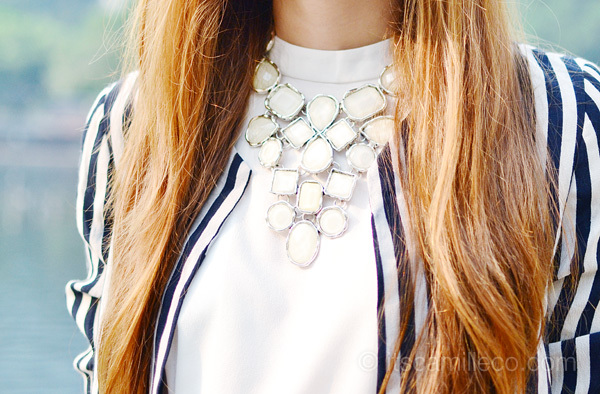 love how you style yourself! :) pretty you! hey camille, we saw you and tricia in MOA yesterday. it was so nice of you to smile at us. by the way, what’s your fave store there? Thanks Caeyo! I love going to Topshop, Mango, Zara, Sm Dept. Store there! Zara always have beautiful jackets. And always fit on you. Buti hindi naiinip yung mga kasama mo kapag nag-a-outfit post ka. Hahaha! I LOVE this outfit! Definitely one of my favorites! Isn’t too much of a hassle to carry clutches since they don’t have straps? I am so nanghihinayang when you say you change into flats and not wear your heels for a long time. :( Parang sayang naman if they’re just for the photos. If I had those gorgeous heels, I’d wear them even while sleeping and “laminate” their soles so they won’t get dirty haha! You know that thin plastic they put on cellphone screens? I’d definitely have those on all of my shoe soles! I love your printed trousers. Bright colors and bold prints certainly give a youthful vibe.